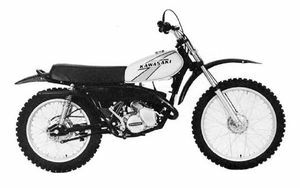 The Kawasaki KD125 is a motorcycle produced by Kawasaki from 1975 to 1979. 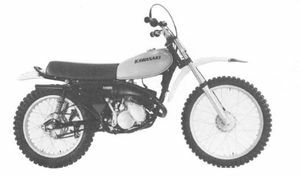 The Kawasaki KD125 was a complete off-road motorcycle manufactured by Kawasaki from 1976 through 1978 and based upon the the Kawasaki KS125. It was not street legal and came with knobby tires. Shop Manual No. 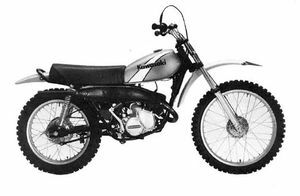 : Refer to the KE125 manual. Shap Manual No. 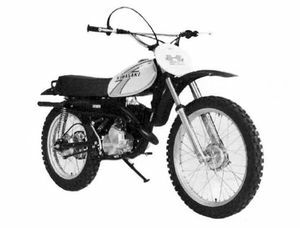 : Refer to the KE125 manual. Major Changes: Color and marking. Rear shocks, side cover, fuel tank, and seat changed; which are same as KE175. Major Changes: Color and gear ratios. Bleed valve added to oil pump. Rotary disc material changed to steel. This page was last edited on 26 August 2010, at 18:07.